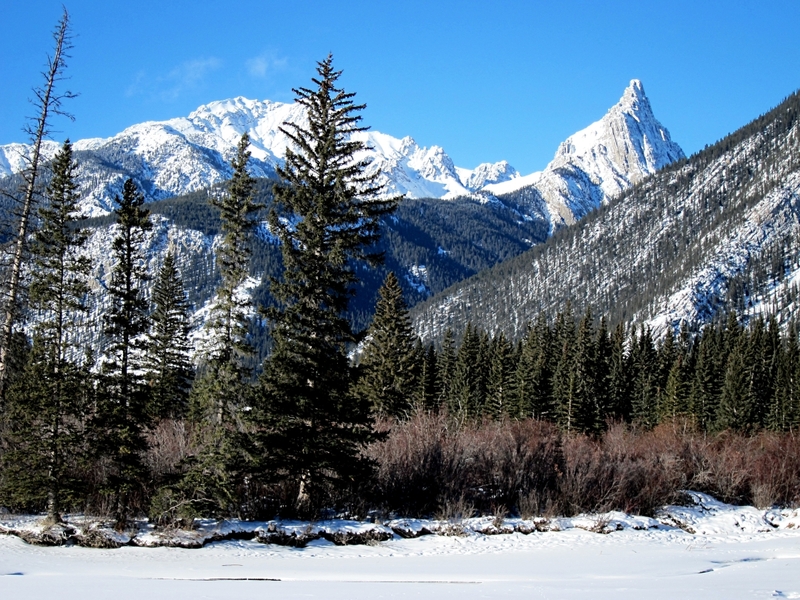 ← Banff and the Bow Valley: Wildlife on the doorstep, walking on the wild side ….. and getting it wrong! I headed to the Bow River again and again it was very cold, I mean very cold. 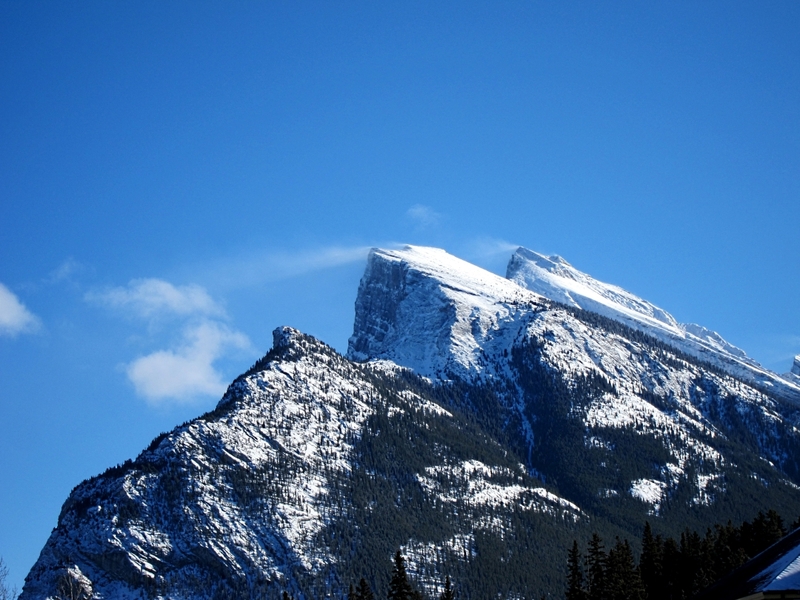 The wind was much stronger than on Monday and could be seen blowing plumes of snow off the peaks of Mount Rundle. Reaching the end of the main street of the town and crossing the bridge over the river the strength of the wind became more apparent. This time I headed upstream towards the historic ‘Cave and Basin’ site, one of the early-discovered 9 hot springs at Banff. 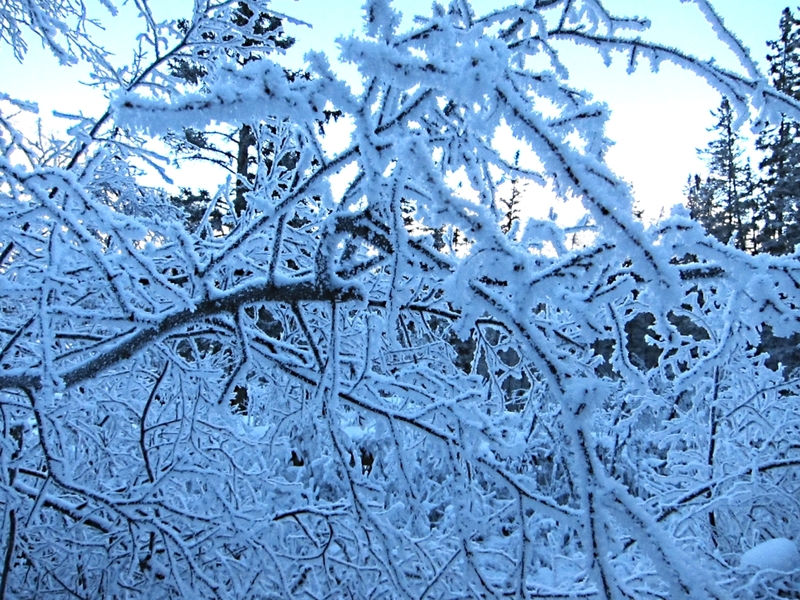 Walking into the north wind soon showed I was underdressed for the extremity of the cold. I should have worn my ski-jacket which is more windproof than my down jacket. 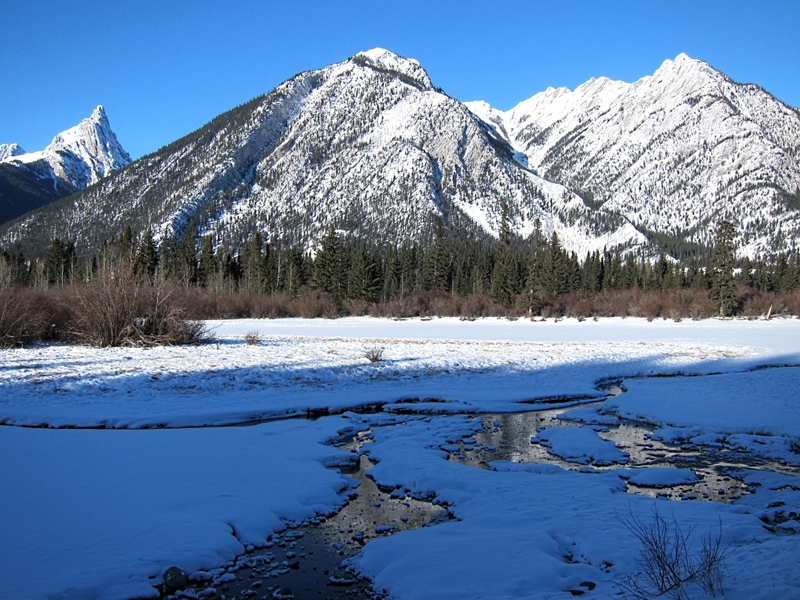 The Cave and Basin site, credited with being the birthplace of the Banff National Park, is currently being ‘revitalised’ and mostly closed so I continued along the Sundance Trail along the river. Just down from hot spring the trail crosses a small stream still flowing through the snow and ice even in this intense cold. 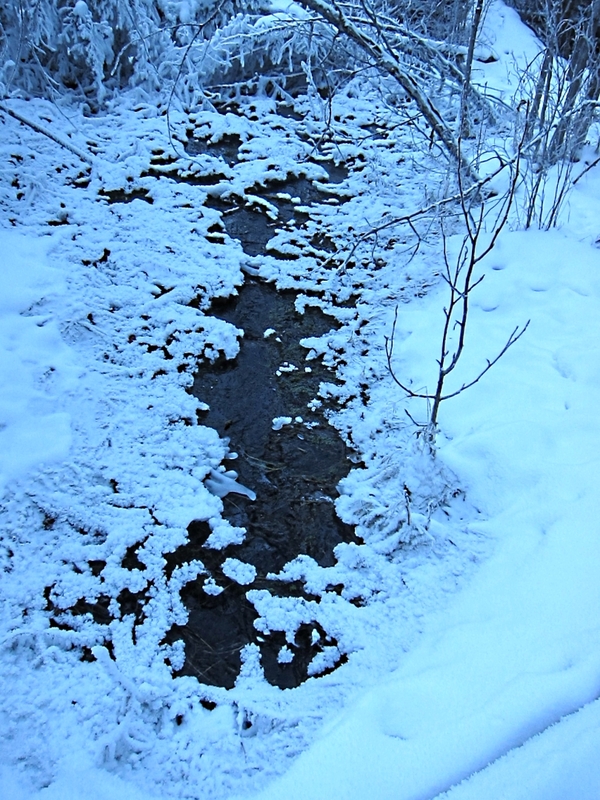 I guess it remains unfrozen because the water is being constantly warmed by the spring. 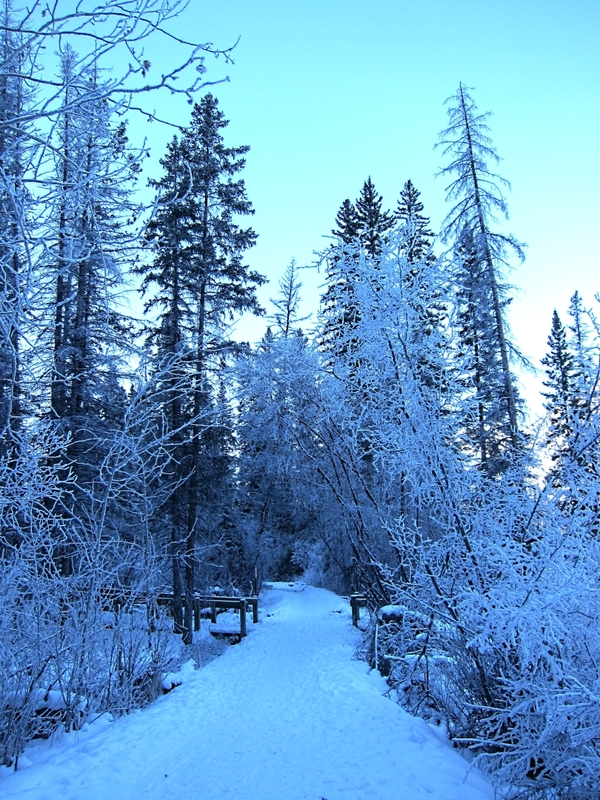 The trees, shrubs and other vegetation close to the stream are blanketed in thick hoarfrost because of the higher humidity creating a strangely unreal effect almost like a fairyland grotto in deep shade but with what little light there is reflecting off every surface. 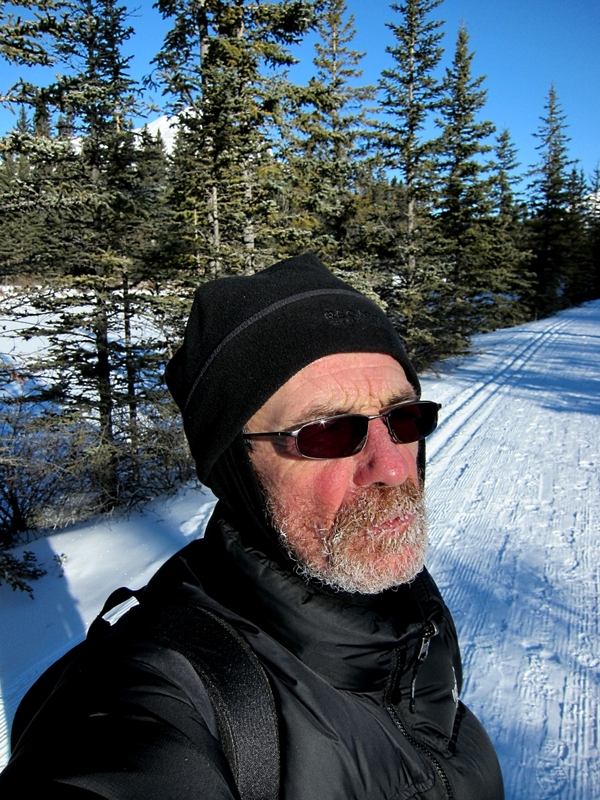 Eventually the trail emerges from the shade of the forest into patchy sunshine but the hoarfrost had now formed on my beard. 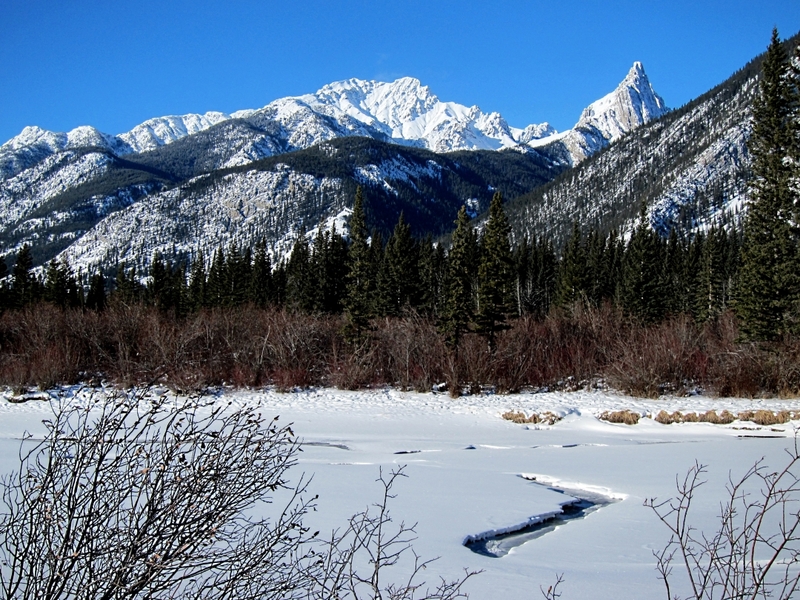 For a while the trail affords sweeping views across the broad expanse of frozen, snow-covered river to the mountain ranges beyond. Even early in the afternoon the shadows are long as the sun as low in the sky. In places there is a narrow channel of flowing water presumably kept open by warmer water from the hot springs. 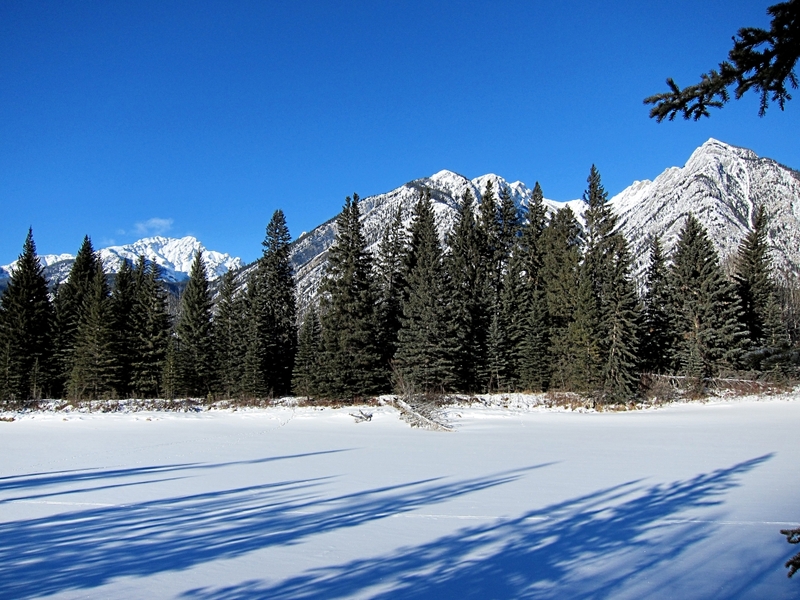 I was heading for Sundance Canyon but time was running on and so I turn back before committing to the 2 kilometre loop. Something for next time. Instead I followed a trail loop which follows the river more closely. Although still only mid afternoon the sun was dropping low. More of the river was now in shade but the snow covered mountains were still reflected in slow-flowing water from the warm springs. 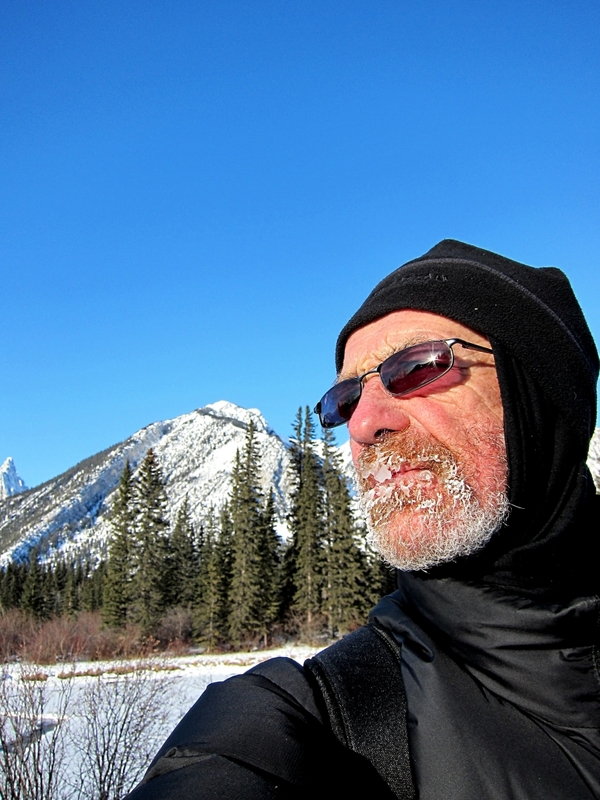 It was getting a lot colder and the ice was thickening on my beard. Sunlit mountains reflected in still-water pools. 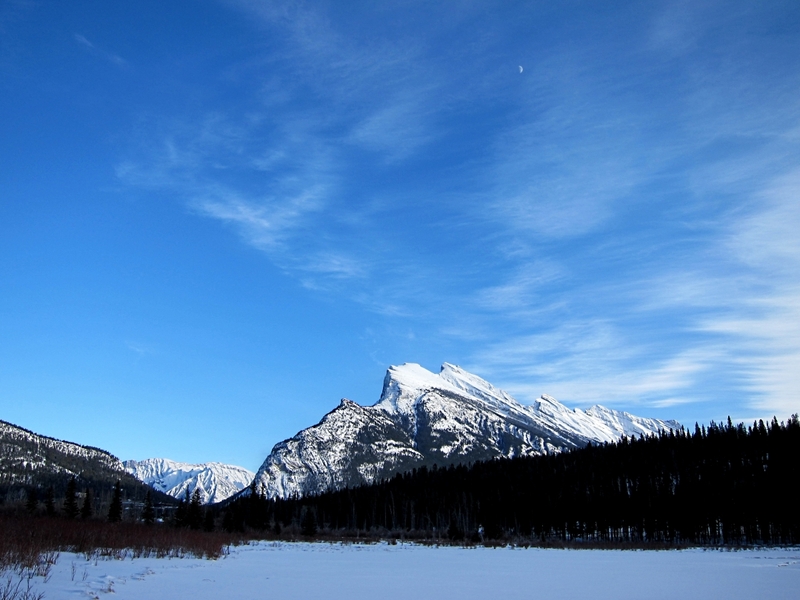 By the time that the jagged outline of Mountain Rundle came back into view most of the river was in the shadow of the mountains which were still gleaming white in the sun. And I was walking more briskly and stopping less often to try to keep warm. I was only out for about 3 hours but by the time I reached the apartment the icicles were so thick on my beard that they formed across my mouth like a Hannibal Lector mask. No wonder people were looking at me strangely. 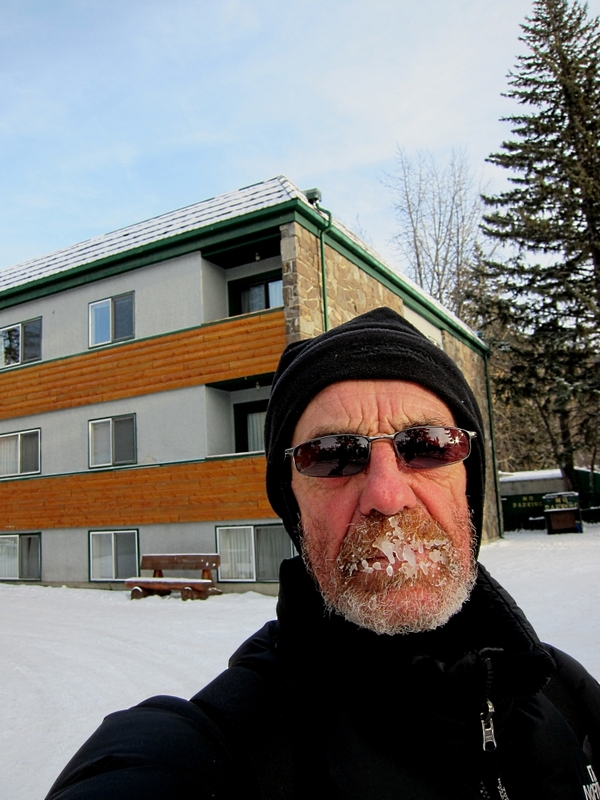 The thought struck me that it was not surprising I get dehydrated out here, it isn’t simply the altitude it’s the fact that I lose a lot of moisture just by breathing as evidenced by the extent of the icicles on my face. It was not as eventful a walk as yesterday but the conditions were very enjoyable, the views were dramatic and it was sad to reflect that I would be heading back to Grey Britain tomorrow. I could happily spend all winter here. It has been disappointing to not be able to continue skiing because of my knackered knee. I had improved and had hopes of continuing to learn during the final week. But the walks of the last two days have given a perspective on the Rockies which I wouldn’t have got from the ski slopes. If I were to come back I would like to continue to work on my skiing but I would also like to spend more time exploring the winter trails.